Seaford Town Council is pleased to announce that it has been able to award large financial grants to seven local organisations. Large grants are those that amount to over £500; the total awarded for large grants this year has been £18,500, all of which will directly benefit the residents of Seaford and the town itself. Lewes District Citizens Advice Bureau was awarded £5,000 to assist in providing their services for Seaford Residents; Community Transport for the Lewes Area received £5,000 to assist with the Dial-a-Ride services in Seaford. Seaford Bonfire Society were once again awarded £1,500 to assist with the cost of security and medical personnel for the procession and display; Seaford Lifeguards were awarded £1,800 to provide vital lifesaving equipment and Seaford Musical Theatre were awarded £700 to re-upholster, clean and repair various seating. Seaford Community Events Committee were awarded £1,500 to help towards the cost of event management and Health and Safety provisions for Motorfest; Waves Seaford Ltd were awarded £3,000 to help with supporting families through counselling and to run Anger Management Courses for children. The Mayor of Seaford, Councillor Linda Wallraven and the Chairman of the Finance & General Purposes Committee, Councillor Mark Brown, both welcomed representatives of these organisations to the Council Chambers to present them with the grant cheques. The Council would like to thank these organisations for their continued hard work and contribution to the Town; it is thrilled to be able to assist and support these organisations where possible. For more information on all of the financial grants awarded this year (included the Small grants i.e. under £500) please visit the Grants page. 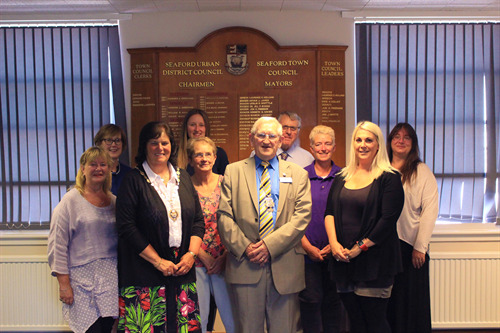 Group photo of the Mayor of Seaford, Councillor Linda Wallraven (3rd from left), and Chairman of Finance & General Purposes, Councillor Mark Brown (centre), with all recipients of Large Grants.